Recorded at Dinemec Studio, Geneva, cut to lacquer at Abbey Road Studios, London, audiophile pressing on 180g vinyl by optimal media GmbH. 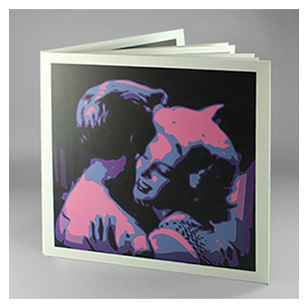 The double album is presented in a deluxe heavyweight matt-laminated gatefold jacket with Singer stitched 11 page booklet of original artwork printed on heavy 250g Conqueror. Features one side of tracks not on the CD. Limited to 1000 copies. Recorded at Dinemec Studio, Geneva, mastered at Abbey Road Studios, manufactured by optimal media GmbH. 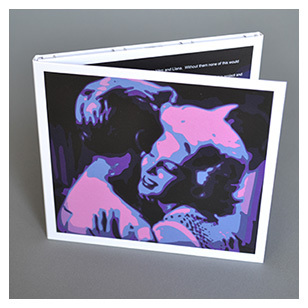 John Aram's fabulous Saturday Night and Sunday Morning Suite now available on 16 bit CD, housed in a deluxe matt laminated triple-fold digipac. In January 2013, while deep in the production of Sine Qua Non, I had the good fortune to witness John Aram’s quintet in concert at Nottingham’s Djanogly Theatre. An homage to one of Nottingham’s best loved literary sons, Alan Sillitoe, the performance was John’s musical suite based on Sillitoe’s seminal Saturday Night and Sunday Morning, complete with back projections devised by Joss Sessions. The music and performance were absolutely transfixing, capturing the best qualities of ‘60’s Brit Jazz and soundtrack, with no suggestion of pastiche. The narrative transitions between the musical sections are signposted by perfectly chosen dialogue from the Karel Reisz film starring Albert Finney and Shirley Anne Field. I met with John after the show. This remarkable record is the outcome and I am very proud to be able to present it on Perdu. The recording, from 24-bit/192 kHz, absolutely kills. (The clip above is a compressed taster). This project began back in 2009. My mother had been ill in hospital in Nottingham and I was beginning to feel the memories of my childhood, watching films with Mum on a Sunday afternoon. Saturday Night and Sunday morning by Alan Sillitoe was a favourite. A working class family and the ambitions of young Arthur who wanted something better for himself. My Mum’s name was Doreen, the same as the heroine in this story. I felt a certain affinity with Arthur as I too wanted to get away. I have been living outside of the UK for over twenty years now and there was a fair amount of nostalgia when writing this suite. As a kid, I was more interested in the places that I recognized in the movie, but as I re-read the book and watched the movie again I was struck by the honesty and brilliance of Alan Sillitoe’s writing. I contacted Alan to explain what I was doing, and asked if I may use some small parts of his work. I sent him a copy and he sent back a lovely letter explaining that he had not been well and had been in hospital. He said that he liked what I had done and kindly gave his blessing to the project. We spoke of the film and the book and the fact that I had once worked with his brother Mike when we played as part of a band in a Columbia Pictures movie filmed in North Nottinghamshire during the miners strike of 1984. I had worked with Kenny Wheeler a couple of years before this occasion and had played several concerts together in both a big band and small groups. I thought it would be wonderful to get him to play on my record so invited him to Geneva for the sessions. As you can hear in his improvisations, Kenny remains unique with his characteristic sound and wonderfully inventive harmonic language. Just before we began recording, Kenny told us that he had played on the original orchestra session for the film soundtrack with the John Dankworth band. John was composer and Kenny had not long been with the band. It was such a pleasure to have him involved, with the accompanying authenticity and connection that brings a little magic to a session like this. Alan Sillitoe loved this story and it seemed to me that these coincidences were tying up the project. I had planned to perform the music in Nottingham with Alan in the audience, but he passed away on the 25th April 2010 before we were able to finalise this. We finally played the concert in Nottingham with Alan’s son David present. David is working hard to ensure that the world does not forget his father’s contribution to British literature and his unique historical dialogue of working class life in Nottingham. It was with great sadness that I learned of the death of Kenny Wheeler within hours of launching SNSM on this site. As I am sure John will concur, Kenny’s contribution to the record is significant, the sound of his flugelhorn inimitable. His was a unique and steadfast voice that enriched British jazz and touched many hearts. The musical world is diminished by his passing. Nottingham’s Coup Perdu went to great lengths with the artwork on this double vinyl release but the music itself is yet more spectacular. This is a contemporary take on Silitoe’s book and film of the sixties, complete with snippets of dialogue from the movie. Aram is a British trombonist living in Switzerland and he gathered a very hot combo to play this suite: Colin Vallon on piano, Andy Scherrer on tenor sax and the late Kenny Wheeler on trumpet and flugelhorn alongside a very capable rhythm section. It's a remarkable piece of work, a mix of contemporary and bebop styles with distinctly European vibe that shows Aram to be a composer of the first order. It's hard to imagine how this record could be improved. Sonically it is outstanding, musically it is so tightly held and counterpointed with drama and tension, as a project it is exhilarating in its intensity. It is presented as 1 of 1000 copies where the pride of ownership rewards far beyond the price of admission. Mr Armstrong of Coup Perdu, thank you. This beautifully presented double album from Nottingham’s hippest jazz label was recorded in Switzerland by composer and trombonist John Aram with Colin Vallon (piano), Andy Scherrer (tenor), Dave Whitford (bass) and Norbert Pfammatter (drums) with the late Kenny Wheeler on flugelhorn sitting in on more than half the pieces. It’s based on Alan Sillitoe’s book and screenplay of the same name and uses occasional clips from the movie to reinforce the link. It’s an extremely impressive and mature work that reflects the moods and themes of the text while working on the higher level that only the language of music can reach. Scherer is brilliant, as is Vallon; in fact this is an extremely strong ensemble with the added benefit of Wheeler, who played on the film’s soundtrack. He contributes two tracks to the fourth side where the mood is very different, with the main Suite taking up sides one through three. The style has a clear bop influence but the British composer gives it some inspired twists that mark Aram out as the best musician you’ve never heard of. Something of a love letter to a city (Nottingham), one of its great novelists (Alan Sillitoe) and a memorable film which shares its title, this musical suite by trombonist Aram features his band of Andy Scherrer (tenor), ColinVallon (piano), Dave Whitford (bass) and Norbert Pfammatter (drums) with Kenny Wheeler as guest on flugelhorn and with little snippets from the film dialogue here and there. It keeps strongly to the 1960s feel and is recorded with great sensitivity to the sonic richness of the instruments. Originally released on limited edition vinyl in stylish cover, it is now available as a CD or download – the vinyl would be the bee’s knees, though. In Geneva where he has been resident the past two decades, John Aram is a well-regarded jazz trombonist and composer (his CV includes numerous TV and film music projects as well) but he’s a relatively unknown quantity in the UK from where he originally hails. Nottingham to be precise is his hometown and that’s the backdrop for novelist Alan Sillitoe’s original screenplay for Karel Reisz’ social realist Brit film Saturday Night and Sunday Morning which is the source for Aram’s superbly realised jazz suite. Using fragments of dialogue from the film that was released in 1960, the suite forms an imaginary soundtrack to the narrative, the tracks split up into scenes or moods based on the film. Although he atmospherically reflects the period in terms of jazz, he updates it with a still lyrical yet more contemporary sounding jazz arrangement. The warm authenticity and elegant execution of the project no doubt owes something not only to the classy line-up, but to Aram’s roots and his empathy with Nottingham’s Working Class culture of the period, as well as receiving novelist Sillitoe’s endorsement and permission to use dialogue samples, even though the writer sadly passed away just before this project was completed. John Dankworth wrote the original soundtrack to the film, and besides the warm echoes here of that score in terms of period and melodic interest, there’s a more direct link via the guest appearance of the late lamented Kenny Wheeler on half the 11 tracks, as he appeared in Dankworth’s orchestra. There’s sensuous soloing too from the likes of saxophonist Andy Scherrer and the Swiss native ECM recording pianist Colin Vallon. If you’re a vinyl addict, get your order in early for a limited edition 180g edition released by aesthetically tasteful new boutique label Coup Perdu, because, as Sillitoe’s iconoclastic protagonist Arthur Seaton remarked, “…all the rest is propaganda”.